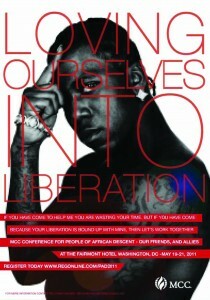 The Metropolitan Community Church's PEOPLE OF AFRICAN DESCENT CONFERENCE will convene in Washington, DC, from May 19-21, 2011. 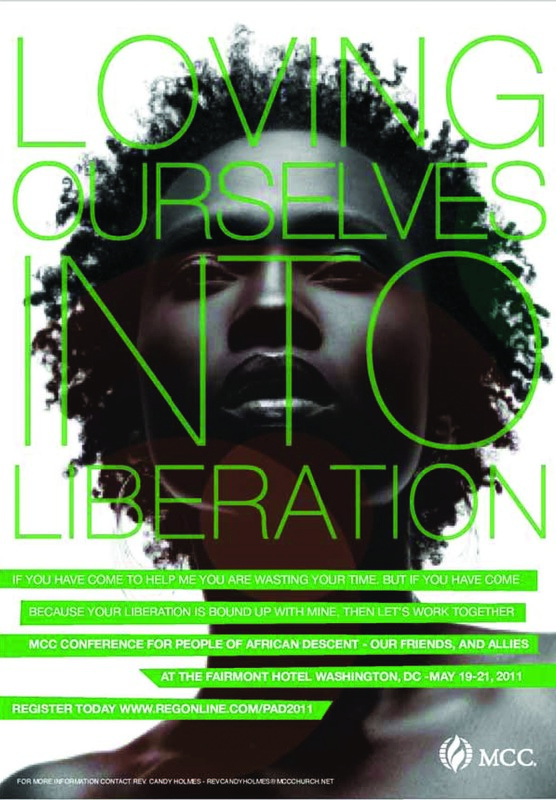 "Since 1998, the MCC Conference for People of African Descent, Our Friends and Allies has been a landmark MCC event. While being firmly rooted in the African-American cultural experience, the MCC PAD Conference is for everyone, regardless of race, ethnicity, or nationality. "The 2011 PAD Conference theme LOVING OURSELVES INTO LIBERATION reflects our commitment to continue our rise from victimhood to victory and to lift others as we climb. To inform and empower us to reach higher heights, workshops and keynote speakers will focus on physical, political, and spiritual health and wholeness. Worship will inspire us to celebrate the fullness of who we are and to embrace the fullness of who God has liberated us to be." NOTE: The PAD Conference will dovetail with Human Rights Campaign's CLERGY CALL 2011.